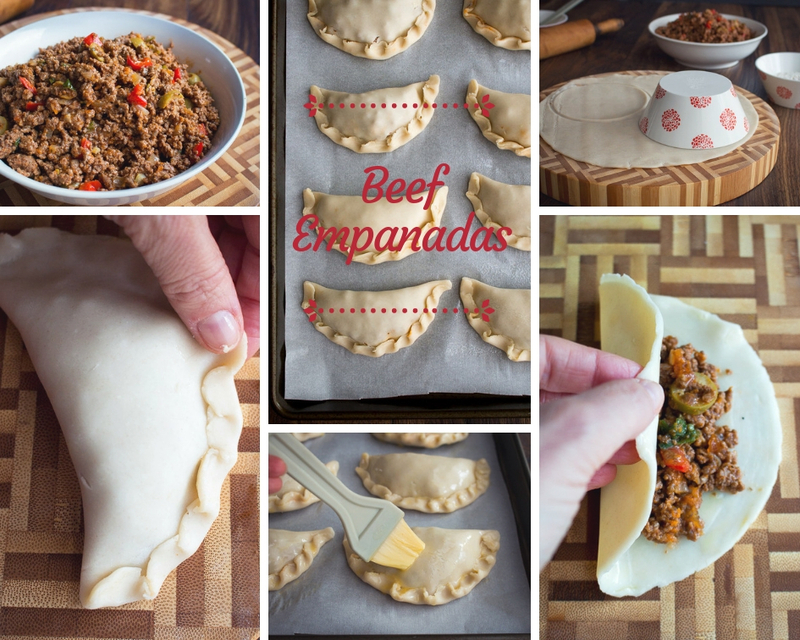 Easy Beef Empanadas are made with pre-made light and flaky pie crusts stuffed with seasoned ground beef, olives, spices and baked to perfection. Super easy shortcuts included to make hosting a Spanish Tapas party a breeze. 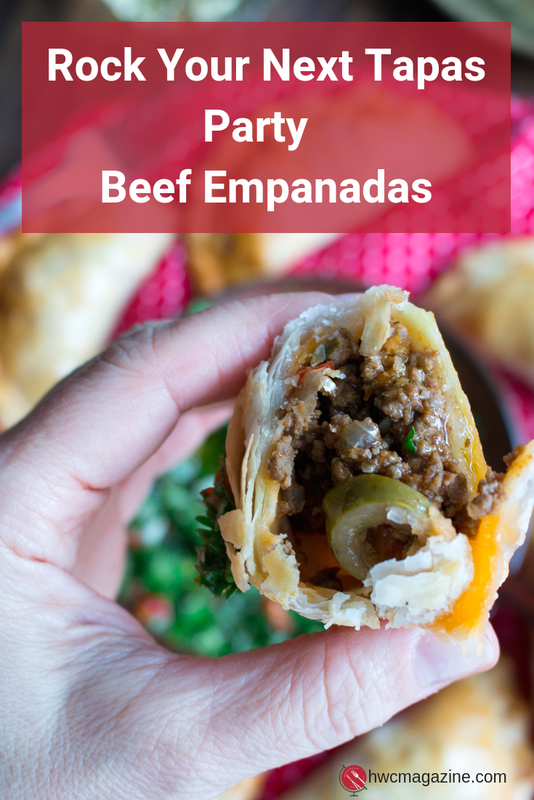 Beef Empanadas are the perfect one handed tapas to serve at a gathering. You are just going to love that first bite into the flaky crust and the hearty savory beef mixture. 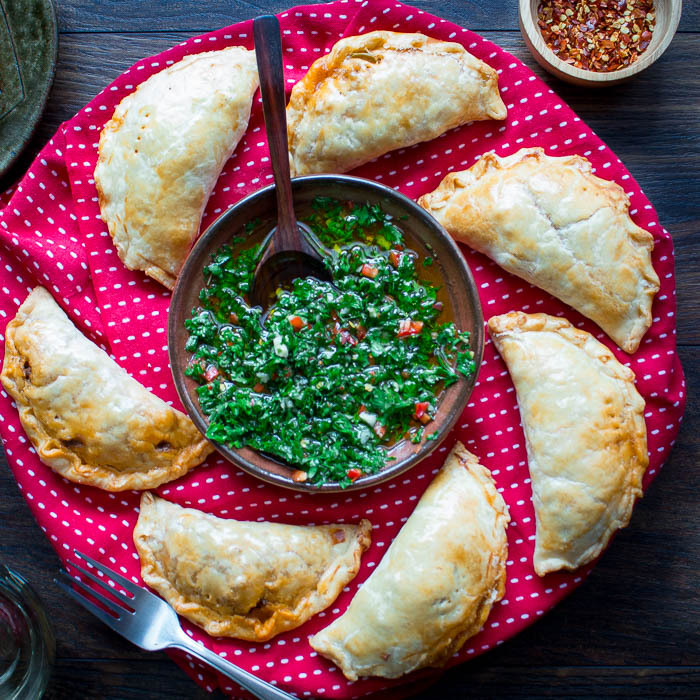 We love serving our beef empanadas hot out of the oven and with a side of chimichurri sauce. 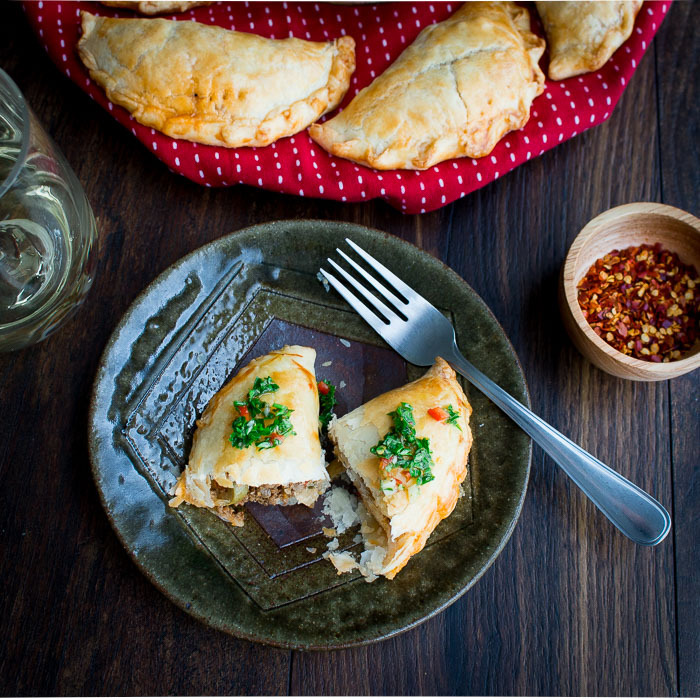 Your guests are going to love you and your beef empanadas too! It is Spanish Tapas Night here at Healthy World Cuisine. Pour yourself a tall fruity sangria and come and join the fun. Last week, we started our fun Spanish night with the Best Orange Almond Flourless Cake dessert. Hey, why not right? Life is short- Eat Dessert first for a sweet ending to your party! Coming soon to a monitor near you will be our fast and easy chimichurri sauce recipe, baked Spanish mushroom tapas. Be sure to check out our recipe for our Spanish Meatballs with Peppers and Tomato Wine Sauce is a hit at any gathering. Empanada treats are prevalent in Spain, Portugal, Latin America, Argentina, Philippines and Caribbean and other places around the world and are a type of stuffed pastry. Empanadas are often served at parties or festivals either as a starter or as part of the main meal. Empanadas have many different fillings depending on where they are originated from. In addition, empanadas can be either baked or fried. Traditional beef empanadas has many fillings such as beef, raisins, olives, hard boiled eggs and such. When you are cooking for 25 guests with 25 different taste palates, it is best to exclude those questionable filling like raisins and hard boiled eggs. Instead, we added in red bell pepper and it was a hit. We have a very dear friend from Argentina. She makes the most wonderful beef empanadas you have ever tasted. A recipe passed on to her from generation to generation is like gold. You are so lucky. She has shared her beef filling recipe with us today. We have never tasted anything that has even come close to it since. We thought about making our own flaky empanada crust for our beef empanadas from scratch as we have done numerous times before. Actually, this beef empanada recipe was first posted back on September 20, 2011 and since then we have learned many lessons along the way. The first important lesson when hosting a gathering is to delegate. The second important lesson is to do as much as possible in advance. The third is to simplify everything you can. If you have been following Healthy World Cuisine that was Bam's Kitchen all those years ago, you might remembered that we made the empanada dough from scratch. Crazy! Right? Hosting 25 people and making everything from scratch. Actually, that might be referred to as insane. We took a very easy and delicious short cut and used store bought refrigerated pie dough. Yes, we did and no one was the wiser. 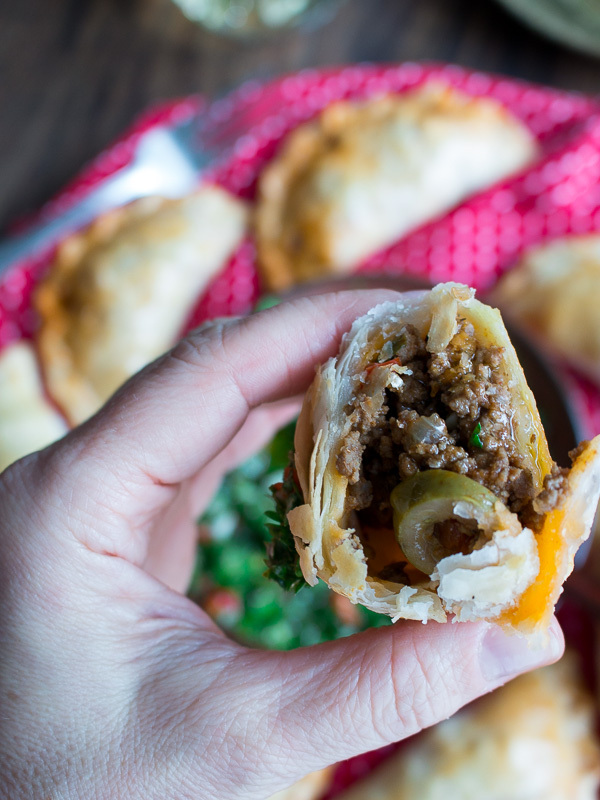 Make your beef mixture in advance and allow to cool completely before stuffing your empanadas. We did this the day before and refrigerated the beef filling. The reason being is that the dough will become soggy and your empanadas will be difficult to seal and work with. Keep your pie dough refrigerated until just ready to use. If your pie dough gets warm, it becomes difficult to work with and sticks on things and more apt to tear. Do NOT over stuff your empanadas. You want to keep about 1/2 inch away from the sides. If the beef mixture gets on the section you are trying to seal, then it could pop open during the baking of the empanadas. You can use the edge of the fork to seal or use the same fold over crimp like you do for a dumpling or pie crust. The edge of the fork is easiest and quickest method. The fold over method is a little more complicated. We used egg wash to seal the edges of our beef empanadas and also brushed on top to give a beautiful golden color when baked. Make sure you poke a little fork hole near the edge of the empanada to allow the steam to escape, just like you would with an apple pie. Pre fill and crimp edges of your beef empanadas and store uncovered in the refrigerator until ready to bake later that day. You can store like this up to 8 hours in advance. As a matter of fact, you will have better results with the baking process if your beef empanadas are chilled 30 minutes before baking. Less likely to pop open during the baking process. Alternatively, you can stuff your empanadas and crimp. Then, you can place on a baking sheet uncovered and freeze until firm and then place in a freezer safe container up to 3 months. You can then bake directly from the freezer, making sure to give them a quick egg wash before you put them in the oven. 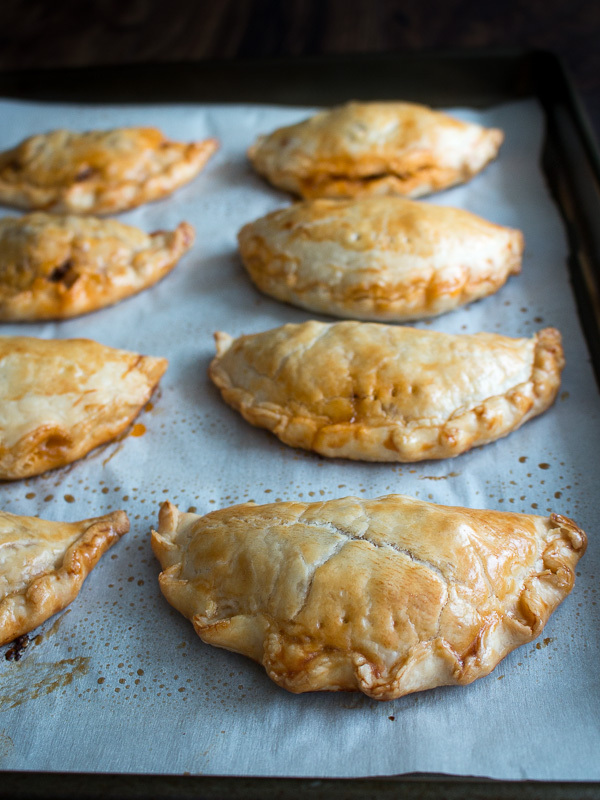 Beef empanadas can be baked before your guests arrive and eaten at room temperature but we really like them hot out of the oven. Once your guests arrive, pour them a fruity sangria and pop your beef empanadas in the oven for about 20 minutes or until golden brown and enjoy. Repeat process until your guests are full or you run out of empanadas. 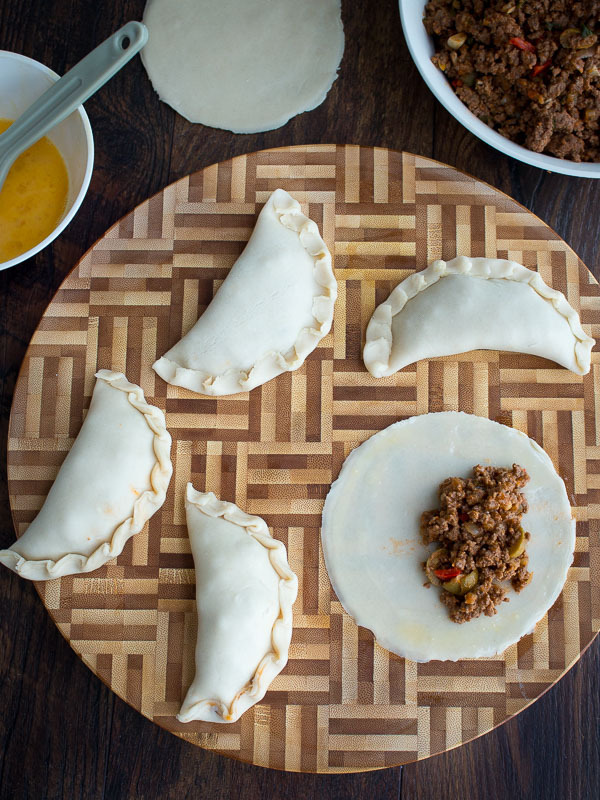 This beef empanada recipe makes 34 medium sized empanadas. We used about a 5.5 inch bowl to make our pastry circles from the pre-made pie crust. 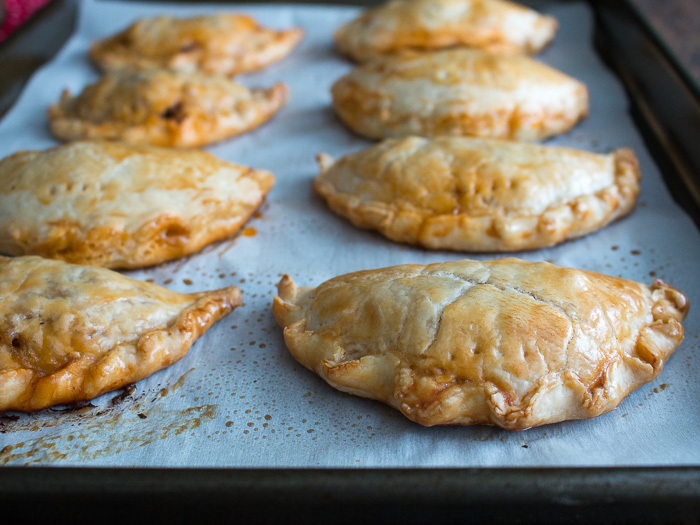 By the time you fold them in half and then crimp, it is the perfect hand held size beef empanada. Be prepared to be hunted!!! You may be asking, "What the heck?" Yes, be prepared to be hunted down and stalked like a wild animal once your guests hear the timer for the oven and freshly baked empanadas are coming out of the oven. We have an island in the center of the kitchen and the oven on the opposite side. 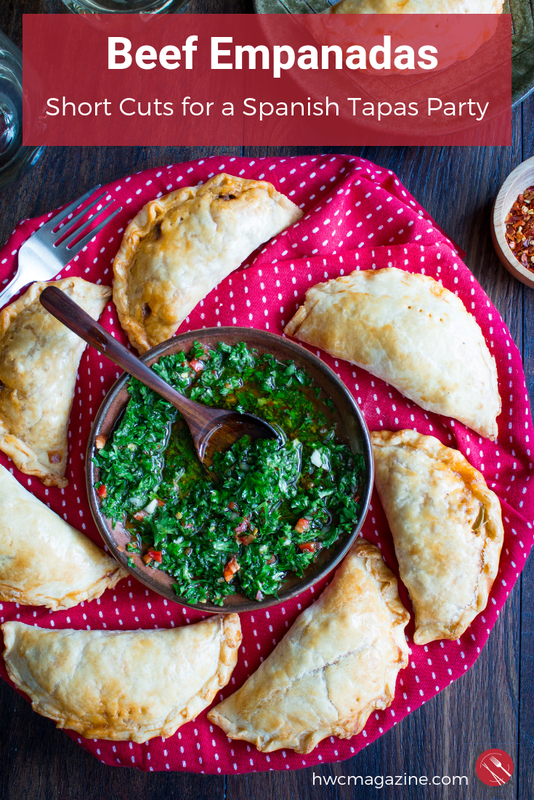 As it was quite crowded in the kitchen and living room area, we placed the freshly baked beef empanadas and placed them on a serving platter with a bowl of chimichurri sauce and walked around offering our guests a taste. Little did we know we had a parade of followers trying to catch up to the beef empanadas tray to grab another taste. 1Place oil in frying pan and heat up to medium heat. Add onion and garlic and fry until aromatic. Add ground beef and salt and pepper to taste and cook for about 3-5 minutes until browned. If excess oil, drain the fat from the pan. Add chopped red bell pepper, tomato paste, (water, broth or wine to thin out a little), paprika, oregano, cumin and green pitted olives and cook for 2 minutes until most of the liquid is absorbed.. You want the mixture to be slightly saucy but not wet as you do not want the empanadas to leak from the crust. Allow Beef mixture to cool. 2Remove the pre-made pie crust from the carton and lie flat on your counter or cutting board. Use a 4 inch bowl to cut out round circles. (We were feeding a huge crowd so we made 34 empanadas). Place a little egg wash or water around the edge of each pie crust circle. Place 2 tablespoons cooled beef mixture into each circle on one side. Close the empanada in half. Press your fingers around the edges. Then you can either use a fork to go around the edges to press and seal or crimp the sides by folding over the edges. Take a fork and place a couple of little holes near the crimped edges to allow the steam to escape during the baking process. Continue this same process with the remaining empanadas. 3Place your prepared empanadas in the refrigerator for 30 minutes prior to baking. Pre-heat oven for 375 degree F (190 degrees C) Brush your empanadas with egg wash. Bake Empanadas for 18- 20 minutes uncovered or until golden brown. 4Serve beef empanadas hot out of the oven with an chimichurri sauce if desired. enjoy! 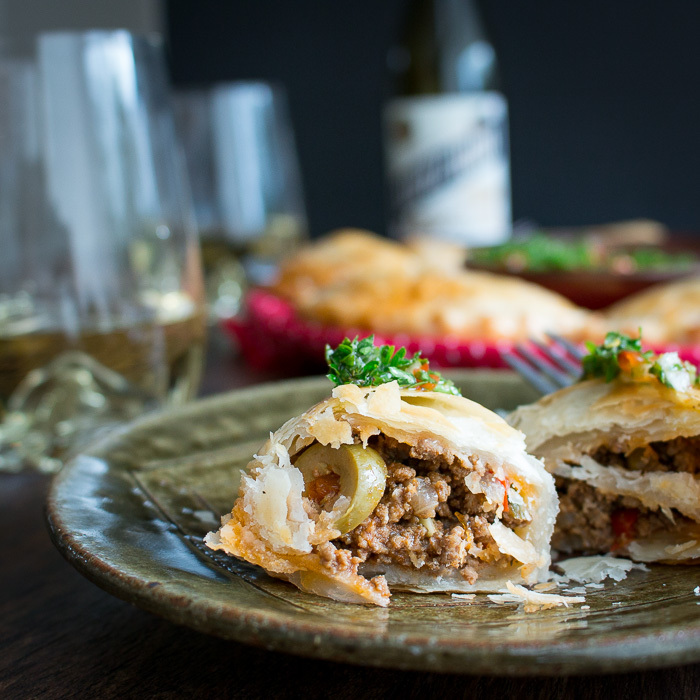 5You can make your beef empanadas up to the point of baking up to 8 hours in advance and store in the refrigerator until your guests arrive and then bake when your guests arrive. You may also freeze unbaked beef empanadas on the baking sheet. Once the empanadas are frozen solid you can place in a freezer bag or plastic sealed container up to 3 months. You can then bake directly from the freezer. Do not unthaw. 6Empanadas can also be eaten at room temperature but they are absolutely fantastic hot out of the oven. 7You may wish to add raisins or hard boiled eggs slices to your empanadas if desired.